There are two methods for making macaroons: the Italian and the French method. Both are used extensively by Parisian bakers and result in cookies which taste largely identical, but the Italian method yields more stable cookies. As macarons are very finicky, I opt for the more stable method. 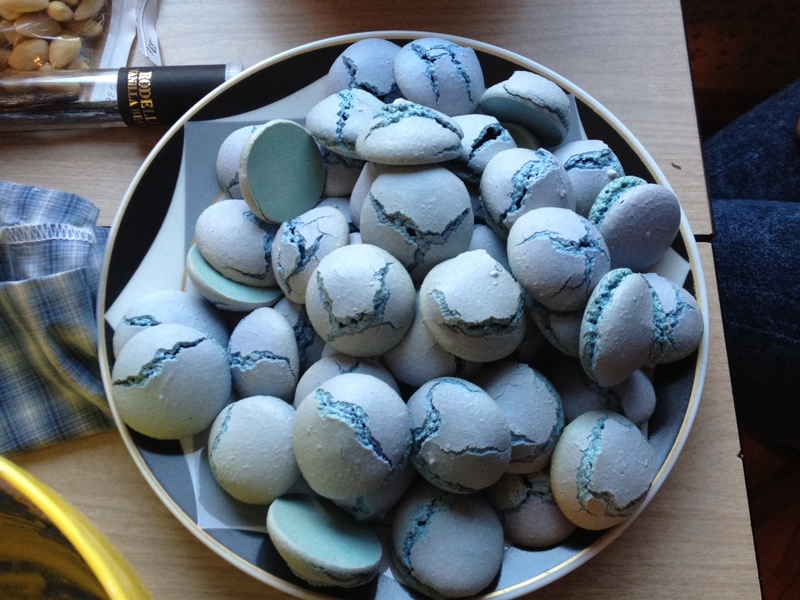 Regardless, macarons can be tricky to make and will likely require a few tries to perfect them. To help you succeed, read through the entire recipe and tips below before starting. For fillings, you can use almost anything. Common fillings include jam, custard and ganache. 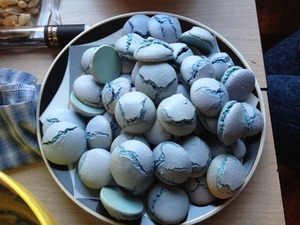 Keep an eye out for macaron filling ideas as well as what to do with cracked macaron shells in future posts. 1. Begin by weighing the almond flour and powdered sugar and sifting the two together to incorporate. Add 110 grams of egg whites and the food colouring. Mix together until fully combined. Your mixture should be about twice as dark as your want your cookies to be. 2. Combine the granulated sugar and the water in a saucepan over medium heat and begin cooking the mixture. Use a kitchen thermometer to measure the temperature of the mixture. When it reaches about 112-114°C, begin Step 3. 3. This part is tricky, so be careful to time things right. See Tips below. Begin whisking the other 110 grams of eggs using a standing mixer (i.e. 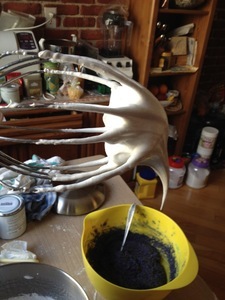 Kitchen Aid) on high and do not stop the mixer. Once the sugar-water mixture reaches 118°C, you will want to carefully add the mixture, pouring it down the sides of the mixing bowl, into the whisked egg whites which should at this point have reached soft peaks. 4. Continue beating until the mixture becomes glossy, stiffens and is not hot to touch anymore. Take out the whisk and when the mixture curls down like a bird’s beak, it is ready. 5. 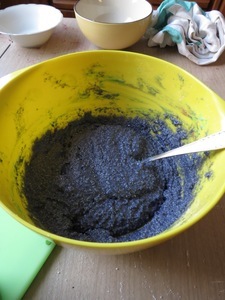 Fold the meringue into the coloured mixture in thirds. Ensure the mixture is fully incorporate but do not over mix. You will know when the batter is ready when you pick it up with a spatula and it falls back down in a smooth, ribbon-like strip into the bowl. After about 10 seconds of dropping the batter into the bowl, it should still be moving. After 30 seconds, the batter should smooth back out to a fairly flat surface in the bowl. 6. Transfer the batter into a piping bag with a plain round tip. Put parchment paper or Silpat on baking trays and begin piping rounds about 3 – 4 cm in diameter. Leave a bit of space in between rounds as they will expand slightly. Once you are done piping a full tray, tap it on the counter a few times to flatten the macarons. 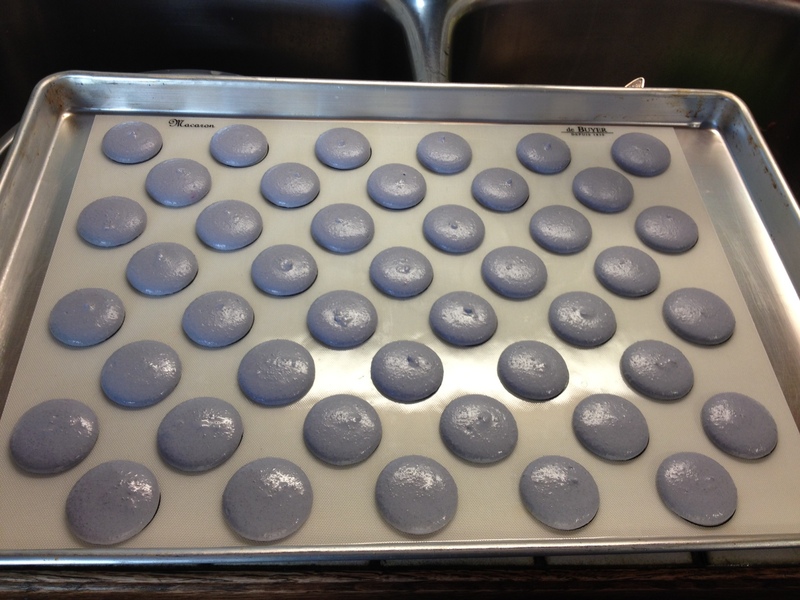 Pre-heat the oven to about 160°C and let macarons rest on the counter for about 30 minutes before baking. Bake for about 12 minutes on until the cookies harden to touch and do not move or shift when tapped on the side. Let cool before peeling cookies off of parchment or Silpat. 7. Form macaron cookies by sandwiching two cookies together with the filling of your choice. 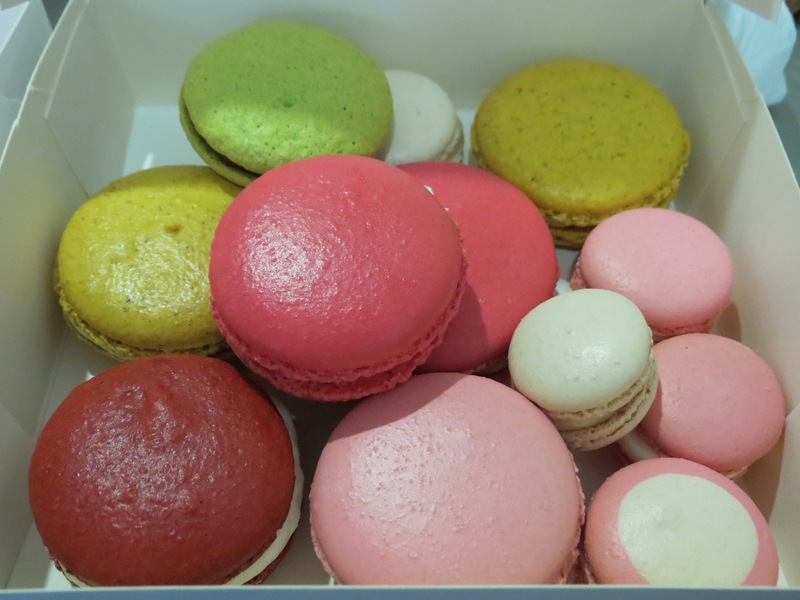 Macarons generally taste better the second and third day after baking and can be kept in a sealed container in the fridge. Instead of using almond flour, you can take blanched almonds and ground these in your food processor. Ensure your food processor is capable of achieving a fine enough, flour-like grind, otherwise the cookies will have a grainy consistency. Alternatively, you can sift the ground nuts through a fine sieve to remove any larger pieces. Combining the sugar mixture and beaten egg whites in Step 3 must be timed correctly with each item at the right stage: the egg whites should be at soft peaks and the sugar mixture at 118°C. The peaks should not have yet reached the hard peaks stage, so slow down the mixer if your egg whites are stiffening too quickly. Do not stop the mixer. Alternatively, if your mixture is not stiffening fast enough, increase the mixer speed or decrease the heat on the sugar-water mixture. It is recommended to use powdered food colouring for macarons as using liquid colours can introduce too much liquid into the batter, changing the consistency and ruining your cookie. 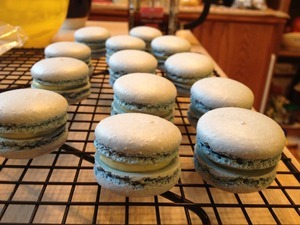 The macaron batter is very delicate and must be piped immediately after it is made or it risks become unstable and resulting in cookies that crack when baked. If you do not have the oven space to bake all the macarons at once, simply pipe the cookies immediately and leave to rest for a bit longer while your first batch bakes. Piping macarons onto hot baking sheets will also result in cracked cookies. If the baking sheets have just come out of the oven, run the baking trays under cold water before piping batter onto them. Great post Genia! Look forward to seeing more. First, lovely to meet you in person, yesterday. Second, I went through a couple of years of The Quest for the Elusive French Macaron on my site, too. Where did you take your class in Paris? I took mine at LeNotre and it made all the difference for me. I don’t make them anymore… too much of a hassle, but can, and did… conquering the elusive macaron, at least! Kudos to you, as well. Did you meet my pal @supersu taking the Master Composting course? Love her. Also, have you considered joining Slow Food? Our local convivium would certainly benefit with your talents! Something to think about! We have a meeting Monday at 6… information on the website. I pipe my cookies immediately and they look exactly as the blue cracked ones pictured above. Any ideas on what else could make them do that?